Family togetherness can be both a blessing and a curse. Once children are grown, families tend to gather together less and less and often only around the holidays. If you've just been with family at the holidays, you know how hard it can be to be under one roof together for an extended period of time. Now just imagine of you weren't just together but that you were quarantined so there was definitely no way to escape your loved ones, no popping out to grocery shop, no walk down the street, no outside contact at all. 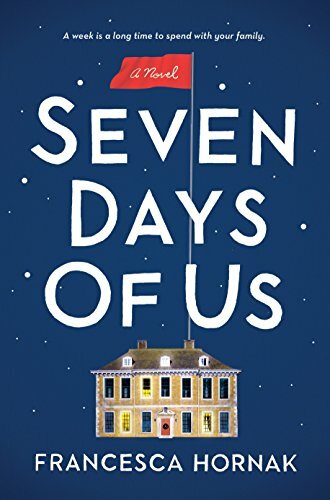 This is the situation in Francesca Hornak's novel Seven Days of Us. The Birch family is about to spend seven days together in quarantine over Christmas. Eldest daughter Olivia is a doctor just returning to Britain after spending time in Liberia treating victims of the deadly Haag virus. She has to stay locked up for the seven day viral incubation period in case she comes down with the terrifying disease. Despite not returning home for the past several years for Christmas, this year Olivia will have more than enough time with her parents and her younger sister at their country place, Weyfield Hall in Norfolk, beyond the reach of good cell service and reliable wi-fi. Mother Emma has just been diagnosed with Non-Hodgkin's Lymphoma but she's keeping her diagnosis a secret, worried that Olivia won't come home if she knows what a danger her presence could be. Instead she's invested in being the cheerful, nothing's wrong, martyr mum as she caters to her family, trying to keep all their traditions alive, even if no one else cares much about them anymore. Father Andrew is snarky and emotionally distant. He's a former war correspondent turned unhappy food critic who is more than uncommonly unkind in his reviews. He's also harboring a secret this holiday season, having gotten two emails from a young American man named Jesse who is the product of a one night stand Andrew had in Beirut before he and Emma married. This heretofore unknown son wants to meet Andrew but Andrew's best defense against Jesse is to ignore the emails and definitely not tell his wife and daughters about them. Youngest daughter Phoebe is used to being the center of attention. She's the golden child. She's also self-absorbed, frivolous, and shallow and she's just gotten engaged to her long time boyfriend, who is a complete and total wanker. She's more consumed with planning her wedding and whether or not George got her the right earrings for Christmas than anything else (except maybe lording her most favored child status over Olivia) but under all of this bratty self-centeredness, she has a lingering sense that her relationship is not all it could or should be. Olivia should be the heroic figure, the doctor who risks her life treating others, but she's so condescending and intolerant of her family's affluence and traditions that she comes across as judgmental and sanctimonious. Like the others, she too is hiding something this Christmas. She's fallen in love with a fellow doctor and the two of them broke the strict "No Touch" rule they lived under in Liberia, a fact that she is at great pains to hide, especially once Sean is diagnosed with Haag himself and is splashed all over the media. Just the secrets and lack of communication between the Birches, never mind their divergent personalities, means that spending seven days together with no respite will not be easy. This enforced family togetherness will challenge them, exposing the cracks in their relationships with each other, highlighting how little they share anymore, and showing how much they still have the capacity to hurt each other. But it turns out that it won't just be the four of them together as two other people show up unexpectedly and are forced to join in the quarantine, complicating the dysfunctional family dynamic even further and stressing things to the breaking point. The novel is told in sections detailing each day of the quarantine and then subdivided into short chapters focused on each of the major characters in turn. As the days pass, the reader can see the frustrations rise, the lack of communication grow, and each character become more purely and stubbornly him or herself. The narrative starts off with some pretty huge, rather unbelievable coincidences but Hornak actually makes them work far better and less predictably than might have been expected. These coincidences don't stop as the story goes on, but by then the reader is invested enough in the outcome that it no longer matters. The characters mostly all start off as not very likable and while they don't change out of all recognition, each of them learns and grows and becomes a little more sympathetic during the seven days they spend together. The end of the novel could very well descend into a treacly disaster of a Christmas story and it is greatly to Hornak's credit that it doesn't, instead striking just the right note for both satisfaction and believability. A generally enjoyable read, this will make you cringe and laugh as you contemplate your own family quirks and conflicts and you'll find yourself grateful that you aren't likely to be (figuratively) locked up with them again until next Christmas.